So much productivity get's lost when I try to get help from Visual Studio .NET. It's amazing that I can go out to the interweb and search through trillions of sources and get answers to my question in the blink of an eye, but when trying to search for the same answers on my local machine, it takes up to 10 minutes. Unfortunately, the two buttons that I have to choose from do the SAME EXACT THING!!... Which is: force me to wait. 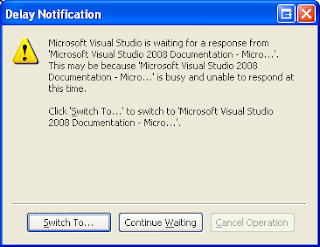 I can either switch to the spinning dialog (first image), or sit and stare at my locked up VS.NET IDE. It would be nice if, instead, Microsoft would index my help files in the background as needed. This way I could search through what has been indexed. A great example of this in action can be found in the Google Desktop utility (if you don't have it, you should get it). It indexes my computer in the background until it's done. It doesn't penalize me when I try to use it before it's done indexing. It never locks up my computer and forces me to wait while it refreshes it's index. Instead it shows me what it does have and then informs me that it's not done indexing. Beautiful. Yeah, that's my new place to hang out too. What a cool site. I can't believe how fast that place has built a new community.